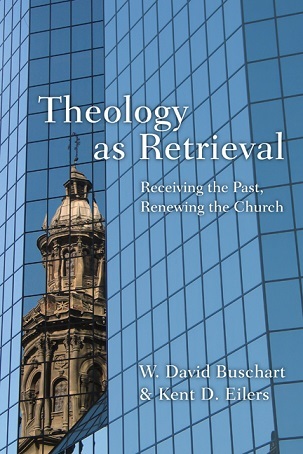 Book Review: “Theology as Retrieval” by W. David Buschart and Kent D. Eilers | J.W. Wartick -"Always Have a Reason"
Theology as Retrieval is an exploration of how theologians might look to the past to gain applicable insights into today’s challenges. It is more than that, though. There are several specific aspects of theological retrieval that are addressed in the book from a variety of angles. After a robust introduction that outlines what is meant by retrieval of theology and the different ways this is being brought about, there are individual chapters on various topics around which retrieval is centering. These are scripture, theology (broadly), worship, spirituality, mission(s), and cosmos. Each chapter has a question that is being addressed by many of the projects, examples of how retrieval is taking place in this specific area, and some of the results of retrieval in that field. For example, the chapter on worship asks the question “Whose House is This?” Then, it traces various responses to the question, whether various Protestant positions or a Roman Catholic perspective. Next, specific examples of how churches went about creating worship spaces alongside their own explorations of Christian thought from the past about the place of worship. Finally, a few concluding remarks are offered about how retrieval is being done in the area of worship. The layout thus allows for readers to pick and choose sections to read while continuing to gain different insights into how retrieval is being done. I found the chapters on worship and spirituality to be particularly enlightening. Buschart and Eilers offer not only examples of retrieval but also serve these up almost as morsels to whet the appetite for more. Throughout the book, there is a sense that there is a vast wealth of knowledge waiting to be retrieved and that the work is only being begun. I think this is an accurate portrayal of the state of theological recovery. After the meaty introduction, the authors tend to take a kind of show, don’t tell approach to the activity of theological retrieval. The examples used are often quite robust, but I was left at times wondering whether it would have been more helpful to add another chapter on how exactly readers might go about their own activity of theological retrieval. The basics are provided in the introduction, and the examples also give several ways of how others have done so, but it would have been nice to have a more substantive overview of methodology. Theology as Retrieval is a good read with plenty of avenues to explore. Readers will likely experience a yearning to enter into conversation with theologies of the past, and the authors provide some avenues to pursue this research. As far as methodology, however, readers will have to develop their own or try to adapt one from the glimpses provided in the book. Disclaimer: I was provided with a review copy of the book from the publisher. I was not asked to give any specific kind of feedback whatsoever. W. David Buschart and Kent D. Eilers, Theology as Retrieval (Downers Grove, IL: InterVarsity, 2015). « “Never use an argument that you don’t find convincing”?